Manna Day was born in Kolkata on 1 May 1919 and received his education at Scottish Church Collegiate School, Scottish Church College and Vidyasagar College, Kolkata. In 1942, he accompanied his uncle, the renowned singer and musician Krishna Chandra Dey, on a visit to Mumbai, thus embarking on a career in music. He started working as an assistant music director, first to his uncle and later to S.D. Burman. Manna Dey began his career as a playback singer with the film Tamanna in 1943. Since then he has recorded over 3500 songs in a number of languages. A versatile singer with an in-depth knowledge of classical music, he has enthralled listeners all over the world over the last sixty years with his dulcet voice and impeccable command over the medium. Manna Dey is the recipient of a number of awards including the Lata Mangeshkar Award of the Government of Madhya Pradesh (1985), the Padma Shri (1971) and the Padma Bhushan (2005). He has also been honoured with the title of National Singer of India by the Government of India. He lives in Bangalore with his wife Sulochana. Sarbani Putatunda (nee Mukherjee) is an academician who teaches English in a reputed girls' college in north Kolkata. She completed her PhD in 1996 and has published a number of research papers in various literary journals. I am a singer and my entire life has been dedicated to music alone. To me music is God-the sole source of inspiration and knowledge. I live for music. Yet, I spent a large part of my childhood wrestling with my friends and picking up fights. Music never appealed to me at the time. But as the saying goes: 'Man proposes God disposes.' The musical ambience of our ancestral house was instrumental in effecting the turnaround from a mischief monger to a music maker. It inculcated the desire in me to excel in music. My first music teacher was my youngest paternal uncles, the legendary singer Krishna Chandra Dey. There were many other reputed and talented musicians and ustads who honed my talent. My mother's liberal outlook provided the required support to pursue my passion. Later, my wife assisted my musical quest and helped me to achieve whatever I have achieved so far. My innumerable fans have been my consistent source of inspiration too. They have stood by me for the last sixty years inspiration too. They have stood by me for the last sixty years and have persistently shaped the urge in me to go on till I reach the pinnacle of success. I am indebted to them. As a singer I have been fortunate enough to sing some wonderful melodies in various regional languages of India. But it never crossed by mind to write an autobiography. Admittedly, articles have appeared about me time and again in different magazines, and I was at times compelled to contribute some myself. But never a complete autobiography! Hence, when Gautam Roy first approached me with the request I simply laughed at the suggestion. 'Who will read it?' I asked Gautam. But Gautam belongs to a class of people who refuse to take 'no' for an answer. He not only forced me to agree but also practically chased me round the country and spent hours to draw me out. I was compelled to give in. most of the time he wrote down whatever I had to say at breakneck speed, and at times even recorded our never-ending conversations. Finally, when he sent me the entire manuscript I was charmed. He had written down things I had merely hinted at but never cared to explicate-particularly certain emotions and feelings which I experienced. It was as if I was rediscovering myself in the autobiography. Finally, I must acknowledge my gratitude to my numerous admirers and fans whose love and admiration have driven me to excel throughout my career. They have repeatedly approached me with different queries regarding my musical journey. I am sure this book will quench their thirst. Future musicians my also find material here to hone their skills further. My best wishes and love go out to all the readers of this book. For over sixty years now, Manna Dey has been synonymous with music and melody. Excelling across a variety of genres-film songs, ghazals, bhajans, classical and pop-he has regaled generations of listeners with his romantic ballads, zany rock 'n' roll numbers, plyful qawwalis and intricate raga-based songs. In Memories Come Alive: An Autobiography, Manna Dey takes a nostalgic trip down memory lane-his early passion for wrestling and football; adolescent pranks which involved shoplifting sweets from a confectionery and pole-vaulting into the neighbour's terrace to swipe pickle jars; and the influence of his uncle and guru K.C. Dey (the celebrated singer and composer of the 1930s). 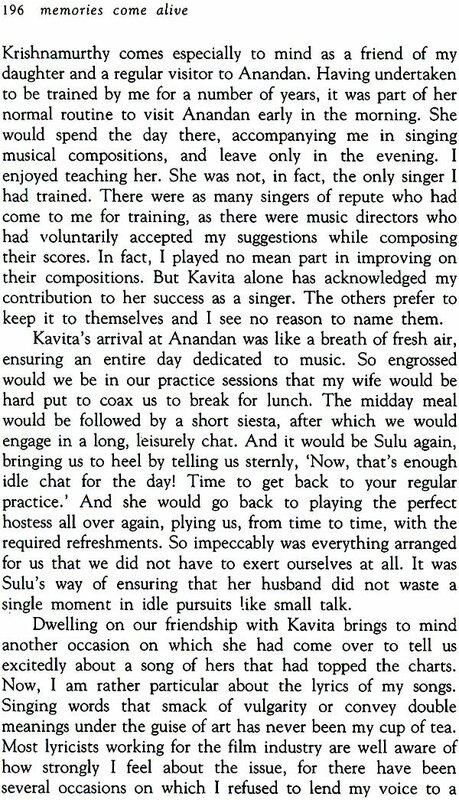 He recounts his early days in Mumbai as an assistant music director to his uncle and to composers like S.D. Burman and vividly recalls the struggle to carve a niche as a playback singer in Hindi films, competing with stalwarts like Rafi, Mukesh and Kishore Kumar. 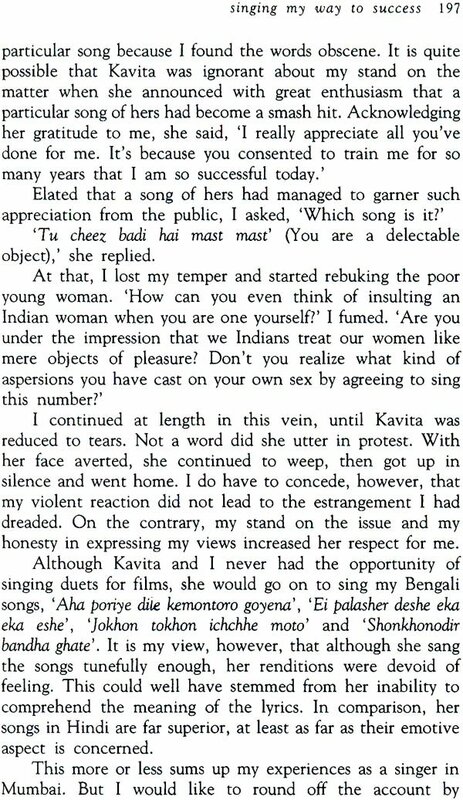 He also discusses at length his foray into the world of Bengali film and non-film music where he came to be regarded as the undisputed king of melody.